From his boundless energy, it’s hard to guess that Jayaraj is nearly 70 years old. He is the consummate entertainer and as I walk up to him, I hear his unmistakable tenor voice enthusiastically singing, “My name is Jayaraaaaaaj” in greeting. Like most people in the leprosy colonies, Jayaraj has had a challenging life. He worked as an accountant for a cruise line company until he was diagnosed with leprosy at the age of 20, at which point he was asked by the company to leave. After that, he taught Tamil and Math in the government’s home school even though he only has an eighth-grade education level. Jayaraj met his wife, Jayamary, while receiving treatment for leprosy. Shortly after they married, a Catholic priest in Chennai told them about the Mogalvadi colony. Both Jayaraj and Jayamary dealt with a lot of discrimination from the local people and felt it was best to isolate themselves in the colony. I’m not naive enough to believe that he is happy all of the time or even every time I’ve been in his colony, but I think he makes a choice. He chooses to be cheerful and to joke, to dance, and to make music with us, and we love to be with him in return because there’s something perspective-shifting about being in his presence. Ava is one incredible little girl. After learning that not everyone in India has easy access to such a simple thing like a toothbrush, Ava’s heart was pricked with a sense of urgency to do something about it. She is an inspiration and a great reminder that everyone can play an important role in this great work. Ava began this project by simply wanting to ask her kindergarten teacher if she could tell her class that she was going to collect toothbrushes for a school her Aunt Heather was volunteering at in India and see if they wanted to help. We spent time as a family looking at the Rising Star website and reading about the kids at the school who need sponsors. Our kids were able to make connections to kids who live so far away and in a different culture, and we loved looking at their smiles and thinking about how much the toothbrushes would make them smile! What started as a small project ended up turning into an amazing experience. There was an outpouring of support and Ava’s desire to help turned into a school and community wide project. 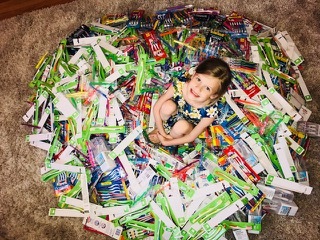 Her initial goal was to collect 500 toothbrushes and after only two week, she ended up collecting 1,838! Ava bravely went from classroom to classroom (with the help of students from the 5th grade student leadership committee) and told students about how she wanted to help the kids in India and asked if they would help too by donating toothbrushes. The student leadership and Ava made plaster, decorated donation bags, and collected for one week. Our school of 550 students came together and donated 1,280 toothbrushes! Students were even asking their dentists if they would donate. At her dentist appointment, Ava told her dentist that she was trying to collect toothbrushes to help the kids in India. We reached out to our neighborhood and left a collection box on our doorstep. Nearly every time Ava went to check the box, there were toothbrushes in it! It was very exciting for her and her little brother, Evan, to keep an eye on the donation box. She kept a record of all the toothbrushes that were donated and the people who donated. If she received toothbrushes in the box and we didn’t know who they came from, she marked it as a “mystery person” donation! During our community collection week, we spent a lot of time on our front porch and we were able to visit with neighbors and tell them more about the service project as they dropped off toothbrushes. We were amazed by the generosity and outpouring of support and encouragement from our community. We received many messages of gratitude from people who were grateful for an opportunity to serve in a small, simple way and for the reminder that we are blessed enough to be able to give to others who are in need. This was an amazing opportunity for our family and community to be a part of. teach our 6 and 4 year olds to love service and their fellow beings, recognize their own blessings, and connect with the world. Now we are linked to the beautiful people of India by something as simple, yet life changing as toothbrushes! 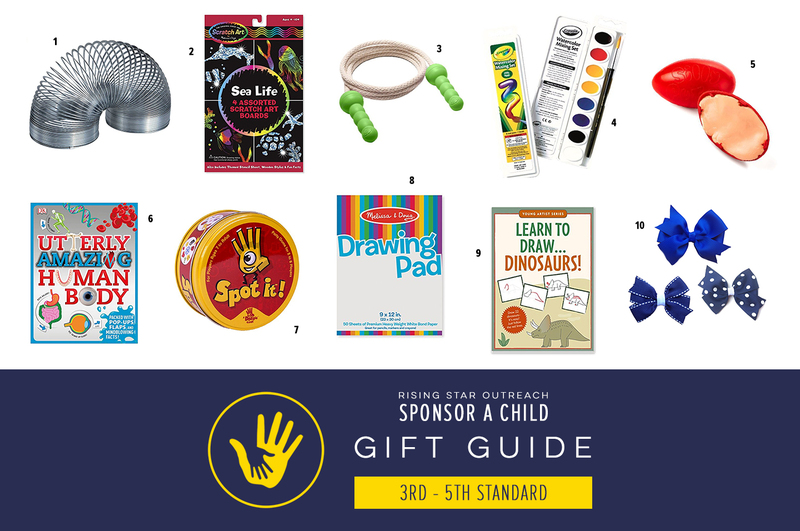 If Ava has inspired you to take action, see all the ways you can make a difference at http://risingstaroutreach.org/get-involved/. 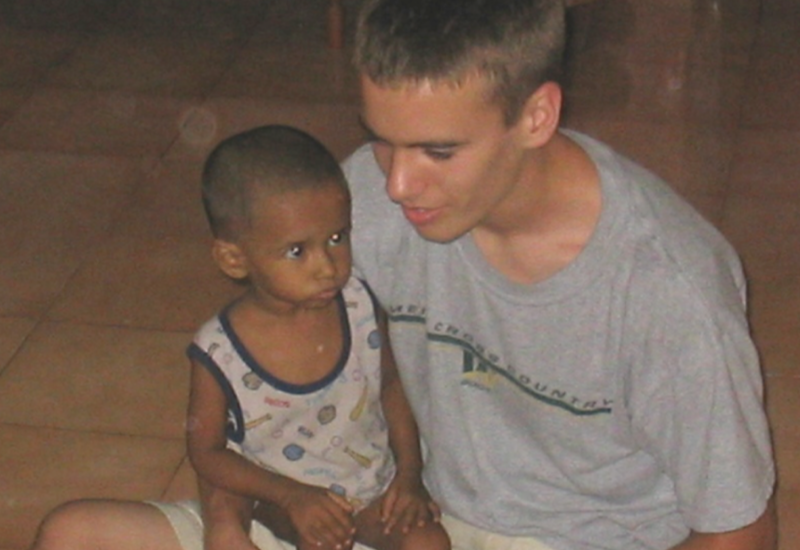 When my son Alex was fourteen, he traveled to India to spend his summer volunteering at Rising Star Outreach. This was in the very beginning of our service in India, before we had opened our own charity. At that point, we were supporting a toddler home named the Sangitha Home. It was quite a challenge –a home with ninety three-to-five-year olds! The woman who ran this charity, Grace Moses, had chosen to concentrate on these ages because they had the most needs. The young babies were easily adopted to foreigners. The children older than five could go to school each day and so required less care. But very few people were serving the toddlers, because they required constant attention. In those days it was very common to see children in very desperate straits on the streets of Chennai. One day, Gopi, our director, picked up a little girl about the age of two who looked as if she were dying. She was too weak to respond to him. Gopi somehow determined that her name was Rani. Gopi brought little Rani back to the Sangitha Toddler Home. Rani was so emaciated from starvation that she threw up the rice that Gopi tried to feed her. He tried giving her bread, and again she vomited it back up. She had been without food for so long that her digestive system had shut down. Finally, my son, Alex suggested that they try giving her just the rice water—the water left over from boiling the rice. Alex had a medicine dropper in his suitcase which he ran to get. Holding her tenderly on his lap, Alex tried giving her just one drop of rice water at a time. It stayed down! He continued to feed her this way until the bowl of rice water was gone. Alex did this for a couple of days until finally Rani’s tummy reached a point where it could accept food. Rani had apparently been pretty abused on the streets because she refused to let anyone come near her. She had taken a liking to Alex because he had so gently brought her back from the brink of death. 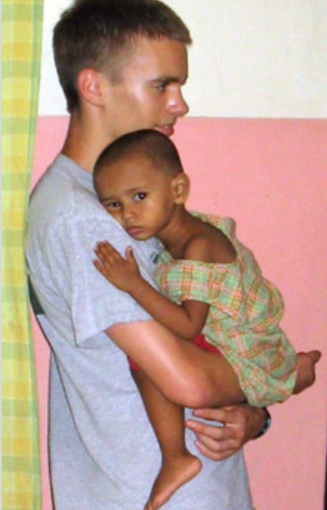 So every day when Alex came to the children’s home Rani would toddle up to him and sit in his lap. He held her the whole time he was there. He would sing to her, talk to her, stroke her hair, try to play games with her. If anyone else came up to her, she would cringe and hide her head in Alex’s arms. Those two little souls bonded so strongly! Every email home, Alex talked about Rani; today Rani smiled! Today Rani laughed! Today Rani let another child come up to join us! By the end of the summer they had become close friends. Shortly after Alex arrived back home, one afternoon he was sitting at the kitchen table working on his homework when the phone rang. It was Gopi from India. Gopi was crying and seemed inconsolable, “Becky, our hearts are breaking in India today.” He went on to say that Rani apparently had a mother, because a woman had come to the home, announced that she was Rani’s mother and wanted to take her. She said that she had made a promise to her (Hindu) God that she would find her daughter and care for her. They tried to convince the mother to let Rani stay until she was completely healthy. They showed the mother how much progress Rani had made. But the mother was insistent. Gopi said sadly, “So she took Rani away.” He sounded heart-broken. When I hung up the phone, Alex looked at me expectantly. He had been able to gather enough from my side of the conversation to realize the call was about Rani. “What is it, mom? What is it about Rani?” he asked anxiously. I explained as gently as I could. “My hands are tied, Alex. There’s nothing that I can do.” Alex had begun to cry. He was hurt and angry. He said, “Fine! I guess I just wasted my summer in India. All I did was care for Rani and now you’re going to let her die.” I could feel his pain and wished that I could help. I sent up a silent prayer for guidance. Into my mind came a story about Mother Teresa that I had read in a magazine, years before. The story was about a woman in London who was a great fan of Mother Teresa’s. I’ll call her Ann. Ann had saved her money so that she could go to India and work with Mother Teresa but when she got to the Home for The Dying in Calcutta, Mother Teresa wasn’t there. ‘Where is she?” Ann asked the nuns. The nuns told Ann that Mother Teresa was over at the infant center. They gave Ann directions in how to get there, and Ann scurried over there. She had waited so long to meet this woman! Spotting the home, Ann stepped quickly inside and scanned the room for Mother Teresa. She was stunned at the sight that greeted her. There were hundreds of babies on the floor, many of them crying. There were six Missionaries of Mercy in the room, doing what they could to meet the needs of all these babies. Mother Teresa was at the back of the room. As she came towards the door, she would stop and point to a baby and say to the missionaries, “This baby right here,” or pointing to another baby, “this little baby right here.” As she did that, one of the missionaries would quickly come up, pick up the baby and take it to a rocking chair. There were half a dozen rocking chairs against the wall. The missionary would then begin to rock the baby and sing to it. As Mother Teresa came to Ann, she herself, picked up a baby and handing it gently to Ann, said in almost a whisper “And this baby is for you.” Surprised, Ann accepted the baby as it was offered to her. It was a frail little baby boy. By the time she looked up, Mother Teresa was gone. A bit disconcerted, Ann asked the workers what she was supposed to do with this baby? One motioned for her to come and sit in a rocking chair. When Ann sat down, in broken English the worker said, “Mother Teresa has a very strong belief that no child should ever leave this earth without having felt the warmth of an embrace and human love. As you can see, there are more than 200 babies here. There are only six of us. There’s no way we can love on each child. It’s physically impossible”. A bit bewildered, Ann began to rock the baby. She hummed the Brahms lullaby. She said she could never forget, how as weak as the child was, how he still pressed his little face into her neck in response to her touch. She rocked the baby until he died that afternoon in her arms. Her life was transformed by this experience. She wrote, “I have friends who would tell me that I wasted that day because the baby died anyway. But I would tell you that this was the holiest day of my life. I learned this day that no act of love is ever wasted.” Ann said that this was a turning point in her life. We have not seen Rani since that day. To this day I still subconsciously look for her whenever I’m on the streets of Chennai. I am fervently hoping and praying that the mother stayed true to her word and took Rani home to care for her. We have been incredibly blessed by God at Rising Star to have now seen hundreds of little lives change for the better through our schools and children’s homes. But we are not always successful with every child. We had two children die last year. One young girl fell into a river that was swollen from a cyclone that was off shore. She had gone home from our school for the summer holiday and had gone down to the river to bathe. She was swept away by the swollen river. Another child caught Spinal Meningitis and died in the hospital. These events would be unbearable if I couldn’t remember the wise words of Ann, when she said that she had learned that no act of love is ever wasted. Those two girls had been cherished and loved by so many at Rising Star Outreach. We cannot control how much life a person is granted. But we can control how much love we share with that person. In the end, I believe that the shared love is the thing that endures beyond this life. I have had to bury both a beautiful daughter and a precious granddaughter. Both deaths would have been unbearable if I could not be comforted in knowing that many days and years of love were shared together and that they will be shared again. Because of our Savior and His marvelous atonement, love is eternal. Each act of love that we share with another becomes an eternal legacy of our lives. You can be the one to make a difference in the lives of our students.